Personalised wedding supplies and favours are a great addition to your wedding reception. But glass coasters and stationery sets are not always the most practical items on the day. Especially if you're having an outdoor wedding reception, why not give each guest their own unbreakable plastic cup as a wedding favour that they can use at the reception? Cocktail-style receptions in particular mean a lot of people milling around. With all that twisting, turning, sitting and standing it's hard to avoid the odd bump and "excuse me" which means accidents do happen and champagne flutes occassionally slip. The solution? Give everyone their own flashy and attractive cup. Plastic cups add vibrant colours and a fun touch to dinner and drinks at the reception. AND if a mug does get away from someone and crash to the floor at least it won't break and leave broken glass all over the place. Perhaps think about plastic mugs too. Because nobody has an excuse if there's a handle to grab on to. Also, when guests are looking around wondering "where did I put my glass?" they'll be able to search based on colour. Or if you want to go that extra mile, have their names printed individually so there can be no confusion. Plastic cups can be very stylish too. Some designs will have a finish that looks and feels like porcelain. These are the best of both worlds, with your panache built in to something that is practical and affordable. Because they're personalised, you can make them emotional, quirky or downright hilarious. 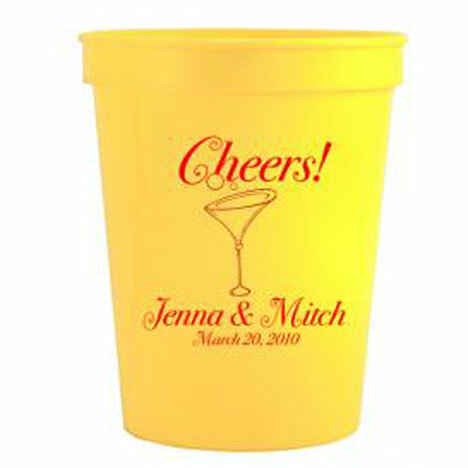 Best of all they're reusable and durable, which means that people will be taking sips out of your wedding favour for years to come and remembering the day. More wedding supplies and favour ideas?? Check out a full list of wedding favour suppliers in our directory and find the perfect gift for your guests.